I spent a decade of my life hip deep in the bond markets, trading all sorts of paper and designing portfolios for clients, and I still find the fixed income world very interesting. While the number bounced around a good bit over that time, from the low 4% range down to just below 1.5%, the trend definitely seems to be steadily lower. Below the fold, I push the chart back to cover the last 20 years. So, are there things to take away from these charts and the patterns they may suggest? Is there wisdom here about how to position for the next 5, 10, or 20 years? The trend started long before the extreme shift in Fed policy that came out of the 2007 - 2008 financial crisis. 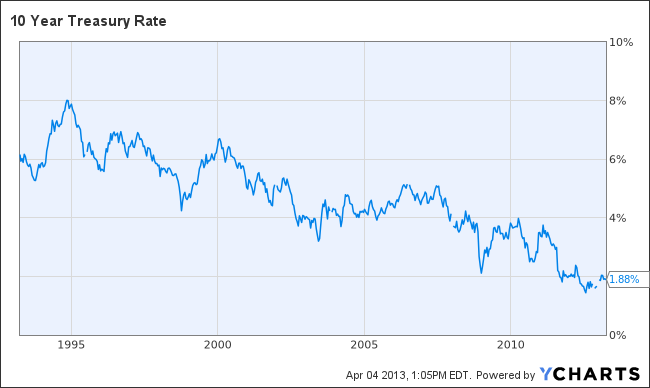 The Fed moving their target rate to ~ 0% has definitely has an impact, but the macro trend was well in place more than 20 years before the "crisis"
There is much discussion in the current marketplace about how rates "must rise" from here and how it is a "question not of if, but when"...My guess is that the reality of what is to come has room for multiple schools of thought to be borne out. 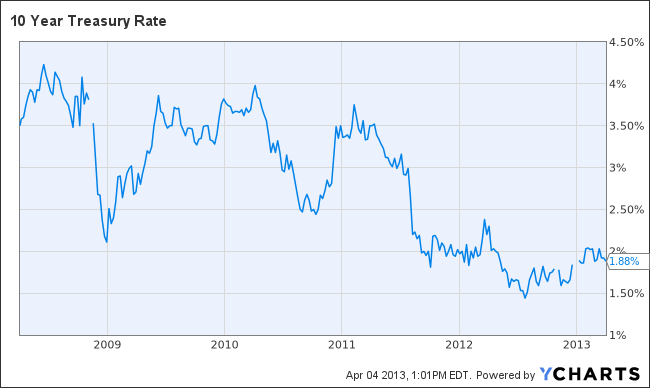 Rates can rise, and even rise substantially from the current levels, and still fit within the macro trend. 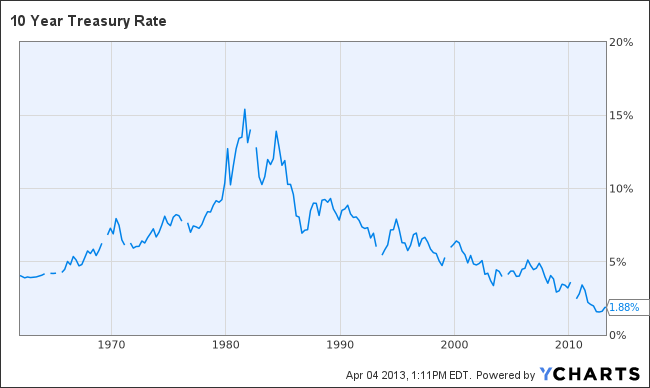 It is easy to imagine that what Bill Gross calls the "new normal" could persist, with rates bound in a fairly tight range on the lower end of the historical spectrum until some unknown event forces a material break in the pattern; my concern is that this unknown event (or events) could precipitate a significant shift in rates in a very short period of time. With all of the above in mind, our view is that there is still a place for people to find value in bonds and fixed income, but only with a thorough understanding of the risks involved. While there has always been a need to understand the risk of a bond issuer defaulting, or the potential for inflation to overtake the value in a fixed income investment, the current market highlights the need to properly account for duration risks (the volatility in present value as relates to a shift in interest rates).